I grew up in North Eastern Massachusetts. My mom immigrated from Portugal with her family when she was about 14. She came here wanting to live the American dream. While she came from very humble roots, she and my dad worked hard to make a great life for themselves and their children - myself and my two brothers. They stressed the importance of a college education even when I was quite young, and like many children of immigrants I had three choices – doctor, lawyer, or an engineer. Although I had a rough start during middle school and the start of high school, I discovered in my first Chemistry class that I had an aptitude for science. By the time I was thinking seriously about college, I was set on Chemical Engineering, and visited many universities, some focused on STEM, like RPI, but also liberal arts schools. Although I had many options to choose from including Brown, I felt most at home at RPI. Sometimes you need to go with your gut! I joined RPI and graduated in 1993 with a BS in Chemical Engineering – first in my family to graduate with a college degree. You have had an outstanding career trajectory. Tell us a bit about your journey. It has definitely been an interesting and fun journey! I started off out of RPI as a process engineer just a few towns up the river at International Paper in Corinth, NY, where I spent a good amount of time in the recycle and waste treatment plants. Ultimately, I followed my friends to Colorado and eventually to the San Francisco Bay Area, actually working as an overqualified barista for a couple of years. I finally landed a job as an applications engineer for a silicon chip manufacturing waste treatment company right in Silicon Valley. It was the late 90s and I was definitely in the right place at the right time. Attracted to the work culture of software start-ups, I made the leap into software quality engineering in 1997 the same year I bought my first book on amazon.com. A couple of years later, I was working at amazon.com as one of two quality engineers responsible for the shopping cart and ordering experience. My work there motivated me to focus on becoming a good manager and a leader later on in life. My 13 years at salesforce.com and salesforce.org have been like a ride on a rocket ship. I attribute my success at salesforce to my focus on making a positive impact for the company, our customers, and employees as well as to all the help I got along the way from my managers, coaches, and other caring individuals. Hence why I spend a good amount of time these days helping others on their journey! What has it been like for you as a woman engineer, leader? How did you overcome challenges that came with it? It’s important to understand that the bulk of what we face as a women or minorities in STEM is implicit or unconscious bias. In fact, women and minorities are also just as susceptible to these biases as their male counterparts. So, I try to confront every situation with a healthy dose of empathy and humor. Empathy because there is a good chance the person across from me is not meaning to offend me, and humor because it’s a great way to diffuse tension and disarm people. From there, I tell a personal story so the person or audience can in turn have some empathy for me! They may think, “Wow, it must wear on you to have your reality challenged on a regular basis!” I think it’s that level of human to human understanding that helps breaks through the biases. Aside from the occasional flub like getting asked, “You are a CTO?” which I am able to handle with grace, I try and focus my time and energy as a leader in understanding how implicit biases translate into structural issues that hold entire groups back. For example, we work to ensure we have inclusive hiring practices, we study compensation and promotion patterns for bias, and support remote work which opens up the hiring pool to a lot more diversity than if you are focused on one geographical area or require people to come to the office every day. In addition, I use every opportunity I can to encourage underrepresented groups to strive for leadership positions as that is where many important decisions are made. Tell us about Salesforce.org. What do you do there? At salesforce.org we know that technology is the most powerful equalizer of our time, providing access to data, knowledge, and – above all – connections. So, we aim to get our technology in the hands of nonprofits and educational institutions so they can connect with others and do more good. Salesforce gives back 1% of employee time, 1% of product, and 1% of equity to the community, which we call the 1-1-1 model. It has resulted in over 200 million dollars in grants to organizations doing important work in the communities in which we live and work. For example, in partnership with the San Francisco Unified School District, we’ve seen 2,000% increase in girls enrolled in computer science in SFUSD, and we aren’t stopping there! Our now 40,000-member strong online community, the Power of Us Hub, as well as our fellow employees, have given back over 2.6 million volunteer hours in their communities. We’re committed to empowering those around us to drive change. I like to joke that Rensselaer helped me develop grit… Mostly, because of those freezing winters! But jokes aside, there is a lot of truth to that… RPI was not easy! That I expected going in. So, it was disconcerting for me when I showed up and did really well my first year. But the sophomore year was challenging and I had a moment where I thought of dropping ‘Differential Equations’. We had an upcoming test and as I returned to campus from a trip home for the weekend I seriously considered just quitting. Late that night I rejected that idea and experienced my first (and last) all-nighter, took the exam the next day, and did fine. Two main take-aways from RPI days that serve me to this day: I learned how to quickly learn new subjects and I learned that not everything will come easily but it’s exactly those things that are worth the extra effort! Outside of academics, I got a lot out of my work study experience and sports. I minored in sculpture at RPI and worked at the studio during open hours. 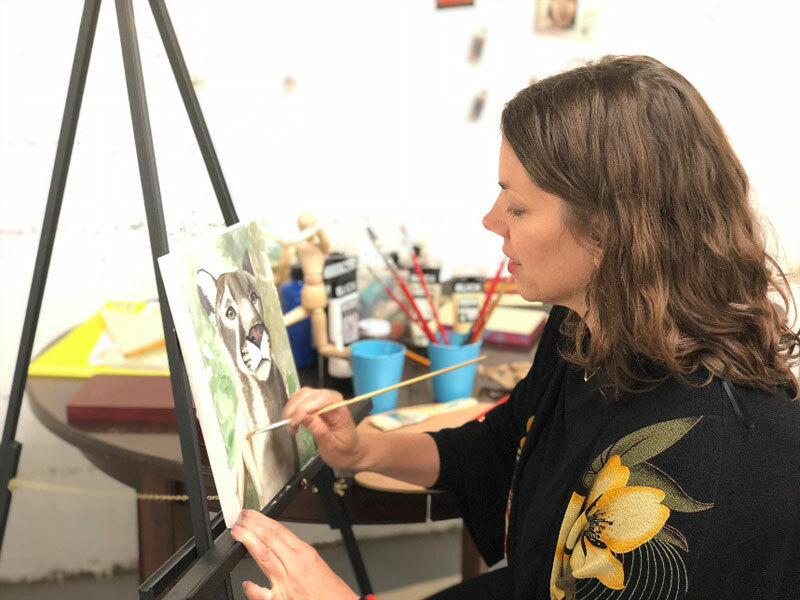 It was a great way to stay connected to my creative side and meet other artistic students. I was also on the RPI ski team. That was a TON of fun and super challenging. We had great weekends traveling all over the NY state to race. 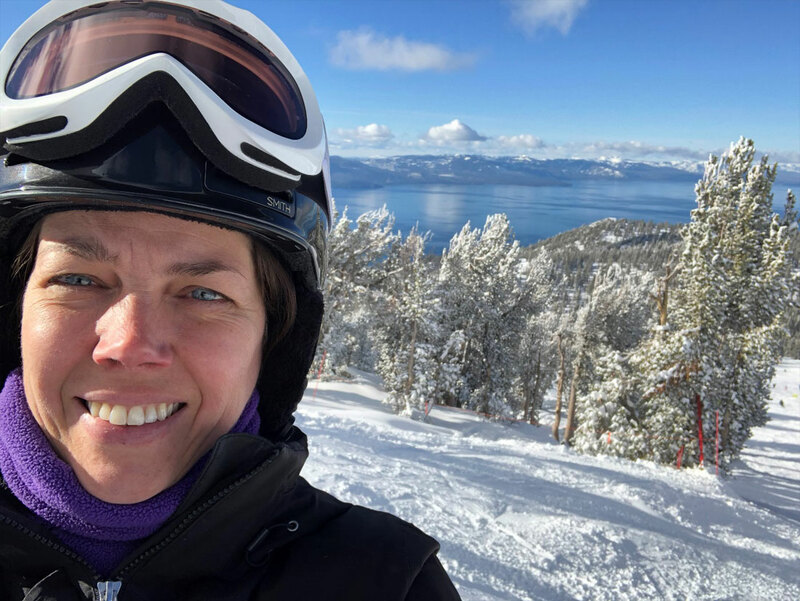 I raced slalom and giant slalom, and while I wasn’t at the top of the pack, it was extremely thrilling to exit the start gate at the top of a mountain and face a string of intimidating gates. We had some stellar male and female skiers on our team and they were a thrill to watch! These days I look for opportunities where my 10-year-old daughter and I can do things together. We both love art, and enjoy sharing a studio space in an artist’s building in San Francisco. We like sports and the outdoors. She’s on many sports teams and I am usually off running during her pre-game warm up. When we aren’t busy with all of that we like to take our little dog for hikes. I miss alpine skiing. I have been skiing since I was 5 and was on RPI’s ski team. But despite my attempts to get my daughter into the sport, she refuses to go! So, I only get a few of days of skiing in a season. What are your favorite books/movies? Or what are you reading currently? Or blogs/podcasts? I am a voracious reader and listener of books and podcasts! I am passionate about leadership, technology, and creativity. Currently, I am reading/listening to Radical Candor by Kim Scott, The Mind Illuminated by John Yates, and the Power of Habit by Charles Duhig. On the podcast side, I listen regularly to Hidden Brain, Freakonomics, Modern Love, She Geeks Out, Unstoppable Women, Artificial Intelligence in Industry, and more. The app Blinkist, which summarizes many popular books, is a great way to preview a book before you commit to reading the whole thing. You are helping Rensselaer in numerous ways. Why is it important to you? Giving back has become a focus for me and a source of growth, satisfaction, and happiness. I contribute time and money to causes I care about – education, women’s rights and equality, animal advocacy and the environment. I volunteered with and served on the board of First Graduate, a nonprofit that helps students be the first in their family to graduate from college. I am the first in my family myself! It has been a real pleasure to become reconnected with Rensselaer and I have been simply delighted with everyone I have met, yourself included. I feel very values-aligned with RPI and am looking forward to giving back in meaningful ways. I was recently interviewed for the Unstoppable Women Podcast, created by Archana Ravichandran, who is genuinely interested in understanding how women break into the upper ranks of the corporations. A few reoccurring themes have emerged as she’s interviewed these high achieving women. First, you don’t have to enter adult life knowing exactly where you want to go or what you want to be. Almost all journeys are exactly that – journeys – with starts, stops, climbs, falls, you name it. I have had three distinct career chapters, and it wasn’t until the recent chapter that I focused on leadership and growth. That was refreshing for Archana as she feels like the message to kids these days is that you have to have it all figured out right from the beginning. The other theme is that sometimes you have to take a few steps back in order to take many steps forward. For me, this captures a mindset that combines humility and growth. I am never too good for something and always have room to grow. These attitudes have served me well (balanced with a sense of self-worth, of course! ).